Right, back to using a bog standard netbook for this entry. It's faster. Much as I love the look and feel of the ipad and my shiny new SII, they just can't beat the click of fingers dancing over a keyboard. Though I'd do a quick entry about one of the ways I combine using the iPad in class with using our VLE, Moodle, plus some online software to produce a rounded lesson. My class (an ESOL Level One group) have been looking at narrative tenses and storytelling. I started off this particular session using 'The £2000 Jigsaw' a listening and speaking exercise from Headway Upper Intermediate, 3rd ed, Unit 3. The listening is actually a genunine text from BBC R4's Today, featuring John Humphries interviewing a girl who found £2000 in ripped up banknotes. Students begin by trying to reconstruct the story from prompts, then listen to check, followed by some more detailed questions. Following this, students are encouraged to speculate why the money had been ripped up in the first place. 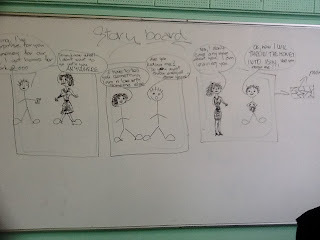 For this phase, I split the learners up into groups, and asked them to make a storyboard of three scenes for the situation. Each group had a large whiteboard each, and spent time debating what the back story could be, and using their mobile phone-based dictionaries to check vocabulary ideas. I swapped groups round and they then had to try and tell the story of the other group's picture. While they did this, I took pictures of each story on the iPad and placed them on Moodle. We then went to one of the IT rooms, where I got the learners to log on, view their pictures and comment on them, and read the task assignment, which was to use Dvolver to make their stories come to life in a simple animation. Overall, a fun, instructive lesson that everyone enjoyed.